The new NBA season doesn't tip off until Tuesday night -- when the Cleveland Cavaliers will receive their championship rings -- but Kyrie Irving has been incredibly busy. 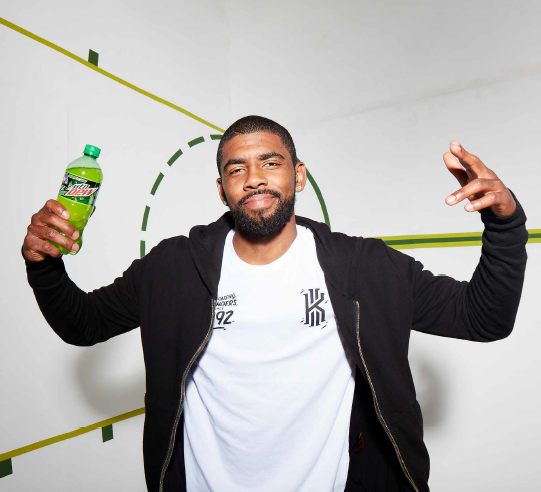 Adding to the list of interesting off-court projects with which he's become involved, Irving announced he will be joining Russell Westbrook as NBA superstars to partner with Mountain Dew. "I am excited to be a part of the DEW lineup," said Irving. "Mountain Dew is a brand that celebrates being an individual and I continue to work to be the best version of me on and off the court. I can't wait for what's coming up next." This partnership deepens the relationship between Irving and PepsiCo, which was established in 2012 with the success of Irving's "Uncle Drew" videos. The original Uncle Drew spot, "Chapter 1", has received more than 47 million views, making it the most-viewed basketball-related video in YouTube history, according to ESPN. Irving also remains a partner of brand Pepsi. The Cavaliers point guard had a chance to hang out with AOL right before tip off to discuss his projects and much more. Q: How exciting has it been to begin a partnership with Mountain Dew? A: Man, it's been awesome. I'm looking forward to it all. We have a few other NBA athletes working together too – myself, Russell Westbrook, Justise Winslow. We're celebrating individuality beyond the game of basketball. Basketball has been a foundation for me, but my life is way more than that. It's about celebrating culture, and I'm all for that. This just makes sense for me. Q: You also just release the new Nike Finals shoes. How cool was that, for you to finally see that design come to fruition? A: It's a dream come true. It goes hand and hand with what we're celebrating at Mountain Dew – the outside of the game and the NBA lifestyle. Dreams do come true. As cliché as it sounds, it resonated and hit home. I came from a household where shoes came few and far in between at times. I had to earn my shoes through getting good grades, with my father. These shoes celebrate what transpired in the last year and it's so awesome. I'm ecstatic. I'm happy we can celebrate the sneaker culture more. Q: How much input do you have? Has anything ever been a surprise to you? What's that process like? A: It's never a surprise. I'm full-blown hands-on, from the coloring to the design to the releases to the stories behind the shoes, to the creative control and what I want the shoe to translate to the consumer. I've seen a lot over my 24 years of life and the ability to help resonate with the culture and the crowd, I enjoy it. Q: Through the partnership with Mountain Dew, you had mentioned you want to celebrate the interesting things you do off the court. Something near and dear to your heart, still to this day, is helping your old high school, St. Pat's, which has struggled financially. How fulfilling has it been for you to not only help that institution financially, but as a role model for the kids through various appearances, talks and other exciting avenues? A: It's been awesome. It started with a promise I made to Coach (Chris) Chavannes. I said, if I was blessed enough to make it to the NBA I'd help the school every way that I could. Those relationships have meant a lot to me, not just as a player, but as a person. Helping The Patrick School now, having the ability to be a mentor has been great. It means so much to my heart. My dad has always taught me to give back, and I know my mom, if she were still alive, that'd be something she'd want me to do it too. It's embedded in my DNA and helping kids get an education and being an important influence on their lives, it's very important to me. It's a family thing. Coach Chavannes is dear to my heart, so helping the kids get off to colleges has been great. Q: You're coming off winning your first NBA championship, meaning you've achieved turning around the franchise culture completely from when you were a rookie. Has this turnaround mirrored other winning cultures you've experienced in high school and college – and business -- too? A: Most important part is that I tried to bring a winning vibe to any culture. From being at Montclair Kimberley to then St. Pat's, where I played with guys I consider my brothers still to this day. Then going to Duke and being a part of a national championship team from the year before, there was already a culture of brotherhood. I've been fortunate to be apart of things like that. But then, if you think about it, I walked into a totally different situation being an 18-19-year-old kid around men with families. Here I am, this little kid and I just want to play video games all day (laughs). The culture was still being built. But here we are, five years later, as a championship team. Being a part of Nike and Mountain Dew has allowed me to help their culture too and I love that. Everyone working behind the scenes matters, and that's why I love being a part of it. Q: Something basketball fans can't get enough of it the Uncle Drew videos. Do you guys have any future plans for that funny franchise? Q: Given your passion for being involved with off-the-court projects, after your basketball days are over, do you foresee yourself becoming more involved as a writer, director or creative mind in media or marketing? A: Yes and partly no. I have so many other passions and so many other things that I want to do. I do see writing as a tool of influence, a tool of inspiration for any message that I want to get across to the world or to a specific group. Telling stories and being part of a story is always a great thing. Ever since I was a little kid, I just never actually expressed (my creativity), but once I was able to have some creative control -- like with Uncle Drew or any commercial I've been a part of – to (write and produce) it's been awesome. It's definitely a passion of mine, but I don't know I'll do it full time. I've been very fortunate to work with great producers and great writers who have been influential on my life. I've seen what goes on behind the scenes, from the actors, to hiring the actors, to writing, to ... just the entire process. I have the utmost respect for writers, producers and directors in Hollywood. I never want to just come in and step on their toes. I'm just trying to be a little, humble basketball player from West Orange, New Jersey who could star in a role here and there, or write or produce segments. Q: So, I have to ask. What do you think about the Indians now that they're in the World Series? Have been tracking their playoff run? A: I have, man. We were actually at Game 2 of the ALCS. I believe (laughs). It's crazy to think about what the last year has meant to the city of Cleveland, or all of Ohio. It's nothing short of amazing. I've seen the ups and downs of Cleveland sports and this, by far, has been the biggest fan excitement I've ever seen in my life. It goes hand and hand we're all excited. It didn't get much media attention, but we have our amateur hockey team here, the Cleveland Monsters, and they won their first championship. The Monsters won their championship, we won ours and now the Indians are chasing. Q: Outside of Cleveland what is your favorite arena to play in? A: Madison Square Garden, probably, or the Staples Center. Q: For non-basketball reasons, what is your favorite city to visit? A: Probably LA or Dallas. Wherever my daughter is. Q: Over the last couple years, what has become your favorite vacation spot? Q: Favorite movie of all time? A: C'mon. That's unfair. There's so many. If I had to go with one that definitely inspired me and changed my whole viewpoint on life, it would be 'He Got Game' or 'Rent' – and we're talking about two completely opposite ends of the spectrum. Q: Whether it be high school, college or pro, who has been your favorite teammate? A: I can't name one person. I have so many different relationships. I can't even do a top three. I have five or six of my best friends that I've played with, so I'd definitely be getting a phone call. Q: We're not trying to get you in trouble here. Forget it. A: (Laughs) Phew, thank you.